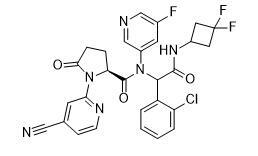 Remarks:Ivosidenib is also konw as AG120; AG 120; AG-120; an orally available inhibitor of isocitrate dehydrogenase type 1 (IDH1), with potential antineoplastic activity. Upon administration, AG-120 specifically inhibits a mutated form of IDH1 in the cytoplasm, which inhibits the formation of the oncometabolite, 2-hydroxyglutarate (2HG). This may lead to both an induction of cellular differentiation and an inhibition of cellular proliferation in IDH1-expressing tumor cells.